Please tell the Japanese Ambassador to Australia that there is simply no excuse for the barbaric cruelty of the Taiji Cove dolphin slaughter and capture. Japanese Embassy in the U.S. The small fishing village of Taiji, Japan, is once again about to become the scene of a brutal slaughter. Dolphins and pilot whales are being herded into a quiet cove. Most of them will never escape alive. They urgently need your voice! Fishermen bang on large metal poles underwater, to create a wall of sound that disorientates the animals and drives them toward the shore. Crowded into the cove and trapped by nets, mothers and babies are separated. Dolphins can be injured in the struggle, and some even die from stress or exhaustion. As the slaughter begins, the sea turns red. 'Drive fishermen' stab the dolphins and whales with long spears and hooks to haul them, still struggling, into the boats -- where their throats are slashed. These killings have been directly linked to the lucrative trade in dolphins for the marine park industry. The documentary 'The Cove' reported seeing dolphin trainers assisting fishermen in herding the dolphins, in order to choose those deemed suitable for a life in an aquarium. Then these trainers turn a blind eye while the others are butchered for their flesh. 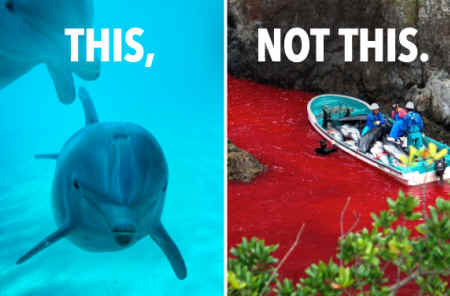 Already, 20,000 Aussies have spoken out for these dolphins and whales. And you can too!